Bookings require a 50% deposit. 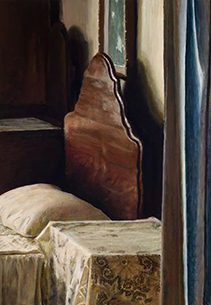 Andries Gouws is well-known for his small meditative paintings of unremarkable topics such as interiors or feet. He studied Fine Art at the Michaelis School of Art (UCT), the RJjksakademie in Amsterdam and the Staatliche Kunstakademie, Düsseldorf. His last two solo shows, "Hiding behind simple things" and "Pedestrian paintings" travelled to all the major centres in South Africa. His satirical piece 'Bluff your way in postmodernism' is often prescribed in university courses on postmodernism. He and his novelist-artist wife Ingrid Winterbach recently featured on the TV programme Kwela. The specific focus of my workshops is the use of colour, and how that interacts with tonality (light and dark). To explore mixing colour I recommend using a very limited palette and exploiting its possibilities to the hilt. This simplifies the problem of mixing colours, thereby making it less daunting. In these workshops we explore a few three colour palettes (plus white). Examples are: raw sienna, magenta, viridian; raw sienna, burnt umber, viridian; and raw sienna. indian red, indigo. Using a limited palette initially feels like painting with one hand tied behind your back. But with time it becomes clear that even with such a confined palette an enormous range of colour possibilities remains. It also helps us to avoid garishness and discover the riches of muted colours. My workshops are hands-on. Participants spend most of the time painting. I give feedback to individual students, and sometimes switch to addressing the whole group when I think that a point will interest others as well (for instance how some famous artist would tackle a problem that has arisen in the workshop). There are no formal lectures. Participants must supply their own paints, brushes and canvasses. Easels and tables are provided. A detailed list of required materials will be emailed once bookings are confirmed and the deposit has been paid. Please bring along some examples of recent work - or high quality photographs of them - so that I can relate my input to your previous work. My approach is non-directive. l explore with each work, (each person has his or her style of working) to see how it can be developed further. A wide range of participants, from beginners to established, award-winning artists, have found these workshops valuable. "I learnt more in a week than I would normally learn in a year"
"Painting master Andries Gouws is unusually generous in sharing hard-won secrets of his craft; he also gives a good amount of feedback. 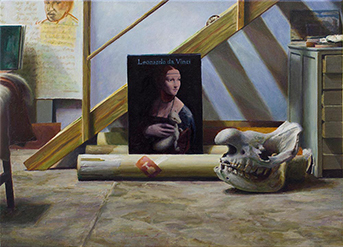 His spacious studio is well-stocked with rare art books that, given half a chance, he tips out for each student specifically, or he hauls up reams of reference from the internet, coming up with names I haven't heard of and breath-taking images. He'll steer your painting work away from your comfort rut, towards excelling inside new sets of limitations. If you want to move your painting skills up a level, book a place on one of his courses." "By creating boundaries to work within,Andries gently encourages your own natural process/style of painting and enhances it by bestowing his vast knowledge of the great masters, materials one uses and art. Much gratitude to him. I highly recommend a workshop with him"
"In its focus on hands-on painting issues it formed an excellent complement to my art studies through UNISA"
"It resolved the 'hump' of colour that has bothered me for years"